It is common for wisdom teeth to grow through the gums sometime in the late teens or early twenties, but they come in much later than that also. Wisdom teeth are third molars that grow at the very back of your gums, and they are the last teeth to come through. Normally our Eagle ID area patients have four wisdom teeth one in each corner up and down. Because wisdom teeth are the last teeth to come in it is quite common that when they finally break through, they come out at a strange angle or get stuck and only partially break through the gums. This is most commonly the result of a lack of space in the mouth. When wisdom teeth only partially emerge through the gums they are referred to as impacted. Wisdom teeth extraction may be needed in this case. 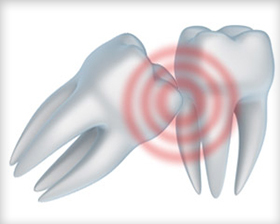 Wisdom teeth that haven’t fully broken through the surface of the gum can cause dental health problems. The most common problem is that food and bacteria get trapped around the edges of the wisdom tooth which causes a build-up of plaque, and that can lead to cavities and tooth decay, gum disease, and infection for our patients in the Meridian ID area. As part of regular dental exams we check for wisdom teeth and make certain they are healthy. If you have any toothache or discomfort, call and we will advise you if you need wisdom tooth removal. We will x-ray your wisdom teeth to determine if infection is present and whether or not to proceed with wisdom teeth extraction. If your wisdom teeth are impacted, but no disease is present the teeth do not need any of our wisdom tooth removal services. The fact of the matter is that there is no proven benefit to wisdom teeth extraction if the wisdom teeth are healthy. Wisdom teeth extraction is done surgically. The procedure may be done in the office and in some cases may require the surgery to be performed in the hospital. Most of the time a local anesthetic is used to numb the tooth and the surrounding area. If the tooth hasn’t come through the gum a small incision is made in the gum to access the tooth. Sometimes a small piece of the bone covering the tooth has to be removed through our wisdom tooth removal services. The surgeon may break up the tooth into smaller parts to make it easier to take out through the opening. If the tooth has partially or completely broken through the gum our wisdom teeth extraction process will be easier because there is less need to make an incision. Most surgeons in the Meridian ID, Eagle, or Boise area use dissolvable stitches to seal up the gum. Often times, gauze is placed over the site of the extraction and you are asked to keep pressure on it by biting your lower jaws together for up to an hour to allow a blood clot to form in the empty tooth socket. Blood clots are a part of the natural healing process and should not be dislodged. The exact process depends on your unique situation. We will walk you through the process and after the extraction is completed we will provide specific follow-up care instructions.